Kalkomey has been acquired by Inverness Graham, a private investment firm that specializes in high growth technology enabled businesses. Kalkomey is a leader in online recreational safety education for state required certifications. Using a web-based delivery model, the Kalkomey delivers educational content and tests through its proprietary e-Learning platform. 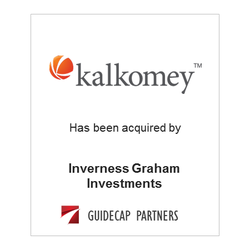 GuideCap Partners initiated the transaction and served as financial advisor to Kalkomey.